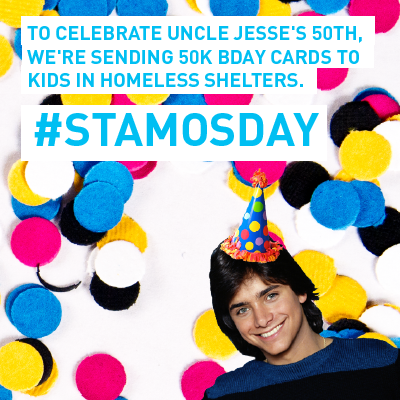 August 19 2013, the day John Stamos turned 50, was declared #StamosDay by DoSomething.org to promote their campaign 'Birthday Mail'. The intention of this campaign was to encourage teens to make birthday cards for kids in homeless shelters. On October 11, the campaign ended. A total amount of 83,356 handmade birthday cards were made and spread to shelters across the United States. Cards were received by a staff member at the shelter. This person would either fill out the card for the birthday boy or girl or pass the card along to friends and family to fill out the card. Either way, the card helped a child or teen celebrate their birthday! Below, you can read some testimonials that DoSomething.org received from teens and homeless shelter. "The idea of a child or teenager not getting at least a card on their birthday made me very sad. The thought had never occurred to me before I read about this project. I wanted to help. I wanted to give a little hope and happiness to them. Something that we take for granted every day can change everything for someone who is experiencing homelessness. This particular project has inspired me to find other things that I can do to make a difference. If everyone did one small good thing...it could change the world." "My 18th birthday was this month, that's a milestone birthday. I can't imagine someone feeling forgot about on such an important day, whether it's your 8th or 18th or any other birthday, everyone deserves to celebrate!" "Each youth was extremely excited to get a homemade card; some of the youth cried because they felt no one cared for them. The card let them know they were cared for." "These cards have been so wonderful to have! We have celebrated many birthdays monthly in our programs, that have brought smiles and light to the child and or teen that received them. This donation has touched , brightened, and warmed many of our abused, abandon and neglected children's Birthdays! We sincerely appreciate the time, creativity and effort that was put into each card received." More information about the Birthday Mail campaign can be found here.